with up to 16 isolated OM5 (5B) analog input modules. Both boards feature screw terminals per channel for the convenient connection of field signals as well as sockets for current conversion resistors (supplied with OM5 (5B) current I/O modules, sold separately). The OMB-DBK207/CJC also includes per-channel coldjunction compensation. This allows OM5 (5B) thermocouple modules to output linearized and compensated values eliminating the need for any components apart from a usersupplied thermocouple. Each user-configurable OM5 (5B) signal conditioning module offers 500 V isolation from the system and from other channels. A wide variety of analog input modules are available for measuring temperature (thermocouple and RTD), strain, volts, current, and frequency. Up to 16 OMB-DBK207 and/or OMB-DBK207/CJC boards can be daisy-chained (via multiple OMB-CA-37-x cables) providing expansion for up to 256 analog input channels. For applications with both analog and digital I/O channel expansion requirements, the OMB-DBK208 and OMBDBK210 expansion boards are available. 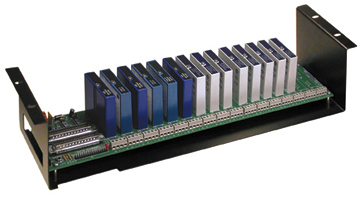 All OMB-DBK signal conditioning and expansion boards are scanned at 5 µs/channel. OMB-DAQBOARD-2000 series boards to three expansion ports P1, P2, and P3).